My name is Jan Douglas and I've lived in Shillington, Pennsylvania since 1998. I grew up on a farm near Green Isle, Minnesota, the youngest of six children. Our family has grown to 51 members and we are truly blessed with good health and longevity, my maternal grandfather having lived to 3 months short of 100 years. Growing up was a simple life which included summers of helping Mom maintain a garden, harvesting and canning vegetables, and cooking meals for the men who worked long days on the farm. In the summer I shared a bike with my sister and brother, taking turns riding, and vacation was going to the lake on a Sunday afternoon. Entertainment was a birthday party or learning to dance the waltz and polka at a local dance pavillion. However, my memories keep going back to Lake Mary, one of Minnesota's many beautiful lakes, where lemonade was brought in a canning jar and carefully poured for each of us - rice krispy bars were a treat and inner tubes were blown up for floating in. Such a simple life, but so very much fun. Upon reaching fall we all helped to prepare and freeze chickens and pheasants to supplement the farm raised beef and pork. The winters were long, but beautiful with icicles up to 3 feet long hanging from the house and barn. With the onset of winter, the demographics of life simply changed from outdoors to indoors with family fun, puzzles, Monopoly, playing card games with Daddy and, for the girls, spending time with Mom who taught us to embroider pillow cases and dish towels. More importantly, Mom taught us to sew our clothes, mostly out of necessity. I began sewing school clothes at age 14 and progressed to prom dresses, flower girl dresses and bridesmaids dresses. Growing up in a Minnesota log cabin with no central heat meant heavy quilts to stay cozy and warm at night. Every quilt was made by Mom out of cotton and 2-3" thick wool batting from the St. Peter Woolen Mills. They were so thick, the quilts had to be hand tied and it was a family event to make a new quilt. We were cozy and warm once we jumped into bed but it was oh so difficult to get back out in the morning and put your feet on that icy cold floor. Memories, so many beautiful memories. Life has been a journey and along the way I moved to St. Louis and joined the Embroideries Guild of America. (EGA). It is a wonderful needlearts group that promotes keeping the needlearts alive by teaching many wonderful techniques to be passed down to future generations. I learned many, many beautiful needlearts, including crosstitch, counted linen work, Swedish hardanger, Danish hedebo, pulled thread on linen, needlepoint, English gold work and needlepoint. There were a few ribbons won along the way at competitions, but the purpose of learning needlearts for me personally has never been to win, it was simply about enjoying the challenge of learning something new and appreciating the beauty of the finished heirloom to pass down to generations to come. Upon moving to Pennsylvania and joining the local EGA guild, I was challenged by another needleart - quilting. Our local EGA raised money by creating an applique quilt for raffle every two years. I was taught my first applique block by Hilary Decker and quickly became a needleworker converted to quilter. It is impossible to live near Amish country and not be enticed to participate in this lovely needleart that challenges us to play with fabric, color and our friends. I was invited to join a local quilt guild in 2000 and I have a dedicated member to thank for my accuracy in perfecting those pesky 1/4" seams. I practiced and practiced, creating quilt after quilt for children which were all donated via our guild to a local service organization that distributed the quilts to first time mothers. Over a period of two years, I made and donated over 30 quilts. Perhaps it was a little crazy, but it was fun and rewarding and brought me to where I am today. 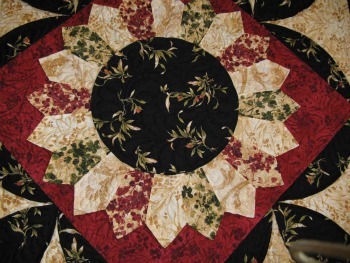 In 2004, I was playing with fabrics at Ladyfingers Sewing Studio in Oley, PA and I was asked by Gail Kessler of Andover Fabrics to create a quilt for market. I remember saying, "Gail, I'm a beginner." Her response, "Jan, you have never been a beginner." Thank you, Gail, for believing in me when I haven't always believed in myself. Over the next few years I had many wonderful magazine placements through Andover Fabrics, including a cover on Quilts and More. 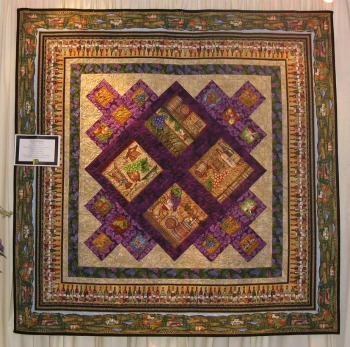 I have also been fortunate to have worked with McCalls Quilting and Beth Hayes through the years, having published my first design in McCalls in 2006 called Art Affair out of those wonderful Lonni Rossi veggie fabrics. Thank you, Beth, for your continued support of my dream. I've also been published in Fons and Porter's Love of Quilting, The Quilter and Quilts magazines. Everything since has been a journey leading to designing quilt patterns for RJR Fabrics and Maywood Studios and heading to Quilt Market in the Spring of 2009. Jackie Robinson - for taking me under her wing and mentoring me every step of the way through the process of setting up my own design company. Jackie, you gave me a reason to believe in myself. Donna Doberstein - a very special friend and quilt artist. I create the designs and Donna turns the majority of my quilts into pieces of art with her incredible talent for freestyle, longarm quilting. Cathy Phillips and Tracy Diehl - for dropping everything to assist me through a last minute dash to a number of quilt markets by also providing beautiful longarm quilting services within days of market deadlines. Mary Mills - for being my fabulous pattern proofer. She has gone above and beyond in an attempt to keep my pattern language, layouts and math clear and concise. Teamwork and friendship is what quilting is all about and without this incredible group of women, I would not be where I am today. And last, but not least, I thank each and every wonderful customer, both retail and wholesale, that has touched my life. It's made me realize the world truly is flat with the ability to connect across the globe via the internet and phone. I would also like everyone to keep Quilts for Kids in their heart. I met Linda Arye while on vacation in November of 2008. Linda runs a non-profit which creates quilts for children in hospitals across the country. A percentage of all of my sales are donated to support her wonderful cause. Please check out their program at www.quiltsforkids.org. it warms the body and whispers of love in every stitch. May your heart whisper your love to your families and friends via the quilts made with your caring hands, passing this wonderful needleart down for generations to come.